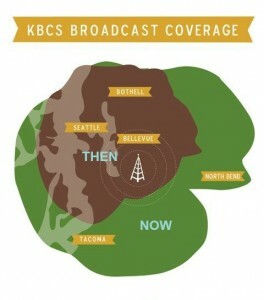 In March 2013, KBCS moved its antenna to a new location on Cougar Mountain (near Issaquah.) 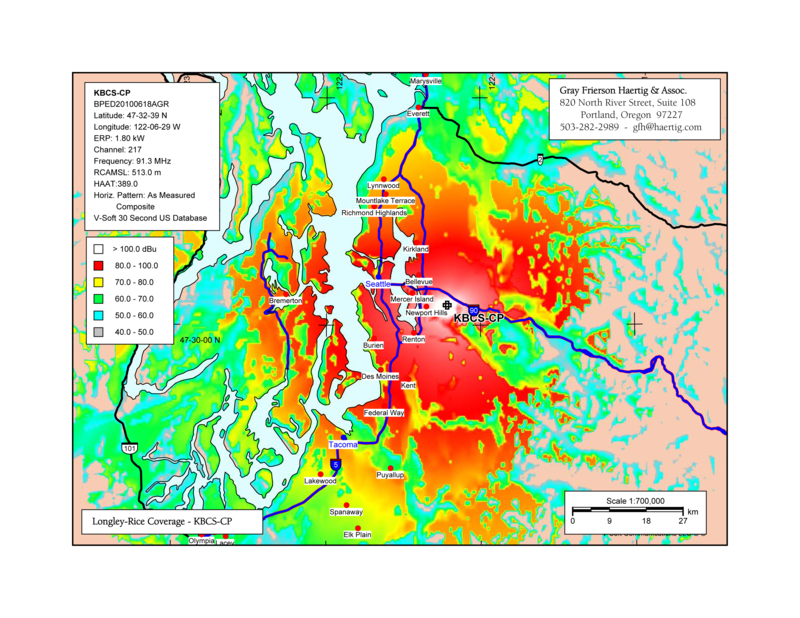 At 1400 feet above sea level, our signal coverage area has increased over 40%, reaching more than 2.5 million listeners across the Puget Sound. KBCS can now be heard as far east as Fall City, as far south as Tacoma, west to Poulsbo and the Kitsap Peninsula, and north up to Everett. In certain areas, however, reception may have changed since the new location changes the path from our antenna to your receiver. This will be most noticeable if your receiver is located on the northwest side below a ridge or prominent terrain (on the northwest side of Queen Anne, Phinney Ridge, or West Seattle, for instance.) Here’s a detailed map of our coverage area. FACT: FM radio waves travel more-or-less in straight lines. They are weakened by objects that get between the transmitter and receiver, such as buildings and mountains. For good reception, a radio must have good selectivity (selectivity is a radio’s ability to separate weak stations located nearby, on the FM dial, from strong stations) and good sensitivity (the ability to receive weak, distant, stations at all!) You already probably have a radio with these features. This radio is located in your automobile. Car radios have to be built to high standards to provide decent reception in a moving vehicle, in the presence of varying terrain, with a serious nearby source of interference (your engine!) You’ve already probably noticed that FM radio reception is usually better in your car than in your house. This is partially because your car radio is probably better than your home radio. Most home radios have poor selectivity and sensitivity (we like to call them “junk” in the radio business). Typical $19.95 radios with analog tuning (as opposed to digital tuning, where the radio station’s frequency is displayed in illuminated numbers) will work, but only near a radio station’s transmitter. Most clock radios, under-cabinet radios, “boom boxes”, etc. just don’t work very well… especially when compared to a car radio! Fortunately, if your less-expensive radio has at least one important feature, you may be able to improve reception: a way to attach an antenna! The closer you are located to our transmitter the better chance you have of receiving a clear signal from KBCS. If there is a large object between your house and the KBCS transmitter (like a hill, for instance) you will probably receive a poor signal! Built-in antennas: Even the lowliest radio has some sort of antenna… typically built-in, with typically poor performance. Most clock/table radios use the power cord as an antenna. (An iPod with an FM radio uses the headphone cord as the antenna.) Except in strong signal areas (nearby a transmitter) none of these perform very well. Signals they receive are usually variable; for example, when you walk around the room, the signal strength will change (usually for the worse!) If your radio has a built-in antenna, and you are nearly satisfied with its performance, try moving the AC power cord around… it may work slightly better draped over the dresser, for instance, instead of lying on the floor. Wire “dipole” (usually supplied with better radios): This is a flexible wire antenna that comes packed with some radios, including the few I recommended earlier. Using this antenna will improve reception somewhat… but as with ALL antennas, it’s not the perfect solution. It is attached to the back of the radio, then “strung up” somewhere in the room as a “T”… with the two ends extended as far as possible from each other. Ideally, that “T” should be stretched out on a North East facing wall. Since our transmitter is located on Cougar Mountain, you want that “T” to have it’s arms spread wide to “catch” as much of our radio waves as possible! Telescoping antenna(s)/”rabbit ears”: Some “boom boxes” and portable radios have one or two telescoping antenna rods. These perform somewhat better than the wire “dipoles” because you can move the one (or two) rods around for optimal performance. You can buy a pair of “rabbit ears” for around $10. Tip: Don’t bother with other indoor antennas that do NOT have a pair of unsightly long rods with them. Circular, ash-tray sized and other types of indoor antennas are meant for UHF television and won’t work very will with an FM radio. Tip: We won’t recommend so-called “amplified” indoor antennas. While theoretically they might improve reception, all they really do is amplify whatever weak signal their tiny antennas receive. The size and location of your antenna – not the price or the beauty – are the biggest determinants of its performance. Outdoor Antennas: If you can somehow manage an outdoor antenna, this is the way to go! Apartment dwellers, cave-dwellers, submarine operators…you probably can’t install an outdoor antenna, although if you have a window, hanging an antenna outside may be possible. The best thing for the rest of us to do is to use (or re-purpose) a TV antenna that’s already on your roof. If you still use it to receive off-air TV, then get an inexpensive TV-FM splitter. Or if you’ve switched to cable-TV or satellite-TV, then just connect your old TV connection to your FM radio. You’ll be surprised at how well this works! If you want to install a new outdoor FM antenna, there are two types to choose from, “omni-directional” and “directional”. An omni, like the Winegard HD-6010 ($20), will receive FM signals from all directions. This is a decent choice if you like to station-hop.If you mostly listen to only one station (KBCS perhaps?) or most of the stations you listen to are located in (more or less) the same direction, or you could use an antenna “rotator”, then you need a directional antenna. The atmosphere is FULL of radiofrequency signals, some of which will conflict with each other. Here’s a few examples of types of interference to KBCS we’ve heard about. Interference from other stations: Typically this can be cured through the use of a radio with better selectivity. In our area there is a Canadian commercial radio station operating on 91.3 which can, depending on your location, over-power KBCS’ signal. If you hear another station while trying to listen to KBCS, try listening on another radio (a car radio, for example) . If the situation improves, you probably need a better radio. Another option is to use a directional antenna, and/or try to re-orient whatever antenna your radio uses. If you can (somehow) increase the amount of KBCS signal while decreasing the offending signal then your radio will be able to separate the two stations better. Multi-path interference: Sometimes the same FM signal can be received by your radio’s antenna from several different places, at slightly different times! For example, if there is a nearby reflective surface (like a cliff face) the signal might arrive at your antenna directly from the KBCS transmitter, then a fraction of a second later after it has “bounced” off the rock cliff face. The radio becomes “confused” and noisy, harsh reception can occur. To cure this, try to either use a directional antenna, or try to re-orient your antenna to maximize your reception. Other sources of interference: There are plenty of other sources of interference possible, amateur radio operators (talk to them), computers, TV’s, fluorescent lights, electric fences…. Try to determine which of these sources is causing the problem and isolate it…. And/or try to improve the FM signal getting to your radio …. by getting a better antenna or a better location for it.